Midfielder Cristian Roldan said the Sounders’ play was not championship caliber. “You feel like you let down a whole city,” Roldan said. “You feel like you let yourself down, your family. Toronto, which lost the Cup a year on penalty kicks 5-4 after ending regulation 0-0, hunted the Sounders at every turn. Whoever had the ball at his feet was promptly separated from support, encircled and ultimately devoured. Coach Brian Schmetzer’s favorite stat, duels won, was a lopsided 58-24 in favor of the hosts, who dominated play to win their first championship. “Normally, our team is very good in that department,” Schmetzer said. “We’ve been good at that all year long. They came out in the first half very fired up. We knew they would be. We made it through halftime, I thought we’d get a little bit of a break, a little bit of reprieve, But they came out and won more duels in the second half. 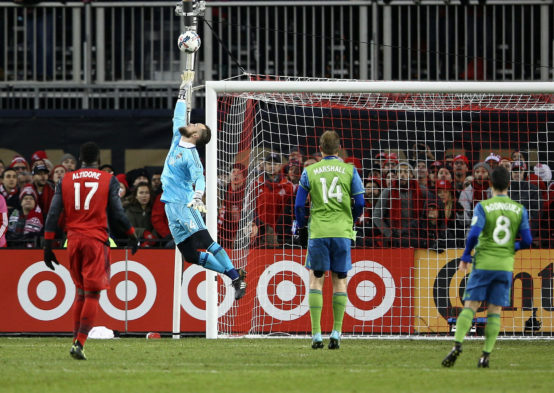 Keeper Stefan Frei was the exception to the subpar play. He made nine saves, a series of sprawling blocks that rivaled his now-famous stop on Jozy Altidore in last year’s final. Toronto had 22 to shots to 7 for Seattle, 11-2 on frame. It was Altidore that found the breakthrough for Toronto and the 30,584 on hand during a chilly but snow-free evening. After a turnover when Seattle had most players committed forward, Altidore ran onto a through ball from Sebastian Giovinco and went one-on-one with Frei, who broke from his line to challenge. The shot went to the right side of the net in the 67th minute as fans erupted, as much from relief as joy after being stymied for so long. The Sounders tried to respond, but grew increasingly frantic as the final whistle drew near. The insertion of Jordan Morris, whose 19 minutes were the longest stretch the second-year forward played in a 10-game span back to Sept. 10 due to injury, did not provide a response. For Schmetzer, the goal disrupted his plan to substitute on left back Nohou Tolo. Before the goal, “We were ready to bring Nohou on and try and solidify that left side and see if we couldn’t generate some more attacking punch,” Schmetzer said. “The response was good up until the end, and it becomes fairly ugly. In the fourth minute of added time, a shot in from the right side deflected off the right post to Toronto’s Victor Vazquez, who casually tapped it in to make the result certain. For Toronto, the win caps off a historic season. It became the seventh team to win the Supporters’ Shield and MLS Cup in the same season, which saw the Reds set records in points (69) and goal differential (37), and tied the Sounders’ mark of 20 wins in a season (2014). For Schmetzer and Seattle, the quest for glory begins anew. I’m very disappointed that the refs didn’t look at the replay on the first goal. But other than that, the refs had a good game. Toronto was simply the better team today. Tip of the cap to them. The Sounders had a phenomenal run; they just came up one win short. No shame in finishing second overall. One team had a bit more motivation which was understandable. Toronto was the ’79 Sonics and the Sounders were the Bullets. This is still a team that can win another title but like with the Seahawks that championship window will remain open for only so long and they aren’t getting any younger. They need to take advantage of having Dempsey on the roster while he’s still playing at a high level.